When your heating and cooling system is malfunctioning, you’ll need an experienced HVAC contractor who can tackle the job efficiently and with quality craftsmanship in mind. 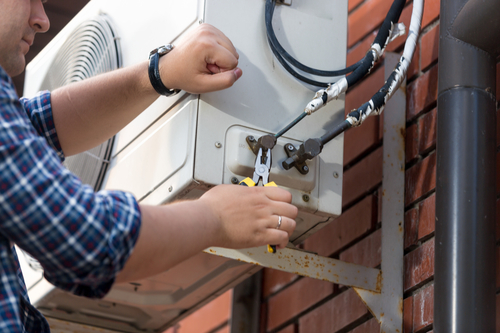 If you’re trying to find the right heating repair technician for AC installation or routine maintenance, here is a rundown on how to choose the perfect technician. What Qualities Should You Look for in an HVAC Contractor? First and foremost, you’ll want to work with an HVAC contractor who is licensed, insured, and experienced in the field. When researching heating and air conditioning repair companies, ask for information on how long they’ve been in business and the training their technicians have in the field. Request proof of licenses and insurance, so you know they can complete work safely and efficiently without liability on your end. In addition to experience and proper documentation, you’ll want to work with an expert that has strong customer feedback and fair prices. Before hiring your contractor, request a free estimate so you can compare overall fees, and don’t hesitate to read online reviews and ask questions if you notice negative feedback. When comparing potential companies, you’ll have to rely on a contractor’s communication skills, work estimate, and experience. With that being said, hearing from previous customers and having candid conversations about their on-site interactions and the quality of work can save you plenty of headaches in the long run. Before making your final decision, request a list of references for added peace of mind that your HVAC team can deliver on their promises. Dave's Cooling Heating & Plumbing has helped residents maintain comfortable and functional homes in Waynesboro, VA, and its surrounding areas since 1984. If you need a top-notch HVAC contractor that specializes in both AC installation and heating repair, call their office today at (540) 942-4357 to schedule your appointment. To learn more about their comprehensive services, including plumbing work and air duct cleaning, visit their website.